Ambhara Hotel Jakarta invites you to experience a unique merger of contemporary European style and Indonesian hospitality. As one of the most exceptional 4-star hotels in Jakarta, we offer business and leisure travelers a refined yet intimate gateway to South Jakarta. Enjoy a dynamic, vibrant location in the exclusive enclave of South, just five minutes from Sudirman Avenue, thirty minutes from Jakarta International Airport and adjacent to the upscale Pasaraya The Pride of Indonesia shopping center. 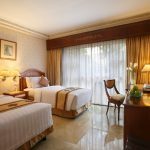 Relax in one of 225 hotel rooms and suites beautifully decorated with classic Indonesian flair and every modern amenity. Enjoy views of the bustling Jakarta Landscape and in-room comforts such as high-speed Wi-Fi, television, coffee & tea making facilities, minibar, safe deposit box, and writing desks. 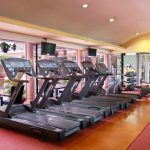 Begin your day with a workout in the state-of-the-art health club. Unwind in the sauna, pamper yourself with a private massage or enjoy a swim in the outdoor pool. Savoir authentic Indonesian specialties and International dishes at Dapur Pelangi Restaurant or enjoy cocktails and live music in the warmth of Barons Pub. Café de France are ideal meeting places for coffee, tea and light fare, and the Terrace Bakery and Coffee Shop offers a wide selection of breads, cakes and pastries. 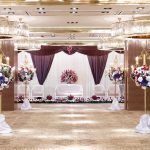 For signature business meetings, weddings and special events, Ambhara Hotel Jakarta offers 16 flexible function venues including Grand Ballroom with experienced planning and catering staffs. The word “Ambhara,” derived from the Sanskrit word for “fulfillment,” reflects our vision to fulfill all your needs for business or pleasure. Throughout your stay at our 4-star hotel, you will enjoy personalized attention from our gracious staff. We look forward to welcoming you to Ambhara Hotel Jakarta very soon. Enjoy your holiday with us, our hotel is Just a 5-minute walk from the popular MRT – Blok M and shopping district.